We usually need a solar controller for our power system term for solar, wind, hydro as it is essential to protect battery. 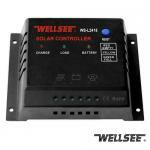 Wellsee solar controller is 12v/24v automatic recognition of input voltage: all solar controller which is used for 12v system also can be used for 24v system, the solar controller will automatically distinguish and work properly. Wellsee solar controllers are suitable for various types batteries, such as lead-acid battery, gel battery, also for Li batteries. Wellsee solar controllers regulate the flow of energy of the battery by PWM (pulse width modulation), it can make solar controllers work well. 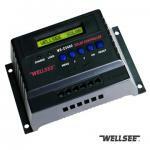 Wellsee solar controllers with LCD display (WS-C2430,WS-C2460,WS-C4860) can set parameters by yourself, such as the full charge cut voltage, low voltage cut voltage and automatic restoration voltage. Wellsee solar controller has temperature compensation functions, when the controller senses a low battery temperature, it will raise the set points. Otherwise when the battery is cold, it will reduce the charge. If the temperature sensor of a solar controller is inbuit, the controller must be mounted in a place where the temperature is close to that of the batteries. An alternative to automatic temperature compensation is to manually adjust the set points (if possible) according to the seasons. It may be sufficient to do this only twice a year, in spring and autumn. Photovoltaic panels work by pumping current through your battery in one direction. At night, the panels may pass a bit of current in the reverse direction, causing a slight discharge from the battery. The potential loss is minor, Wellsee solar controller can easy prevent it. 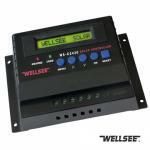 Wellsee solar controller has overload protection, the controller will stop working when overloading. A circuit is overloaded when the current flowing in it is higher than it can safely handle. This can cause overheating and can even be a fire hazard. Overload can be caused by a fault (short circuit) in the wiring, or by a faulty appliance (like a frozen water pump). Some charge controllers have overload protection built in, usually with a push-button reset.